The person I acquired these from explains below and in a detailed letter how he obtained these several years ago. 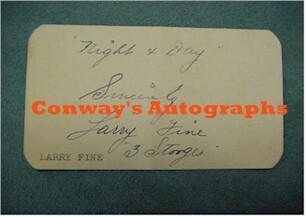 If you are a Stooge fan, I don't have to tell you the rarity of these "FULL" signatures with "Curly". Never before have I seen such inscriptions that provide a personal side of these three comedy legends. Beautifully framed and matted with a great crisp glossy photo. See above. 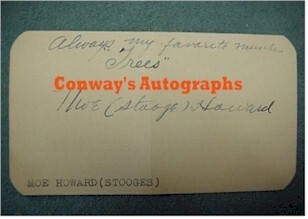 Beware of massive Three Stooges autograph forgeries, particularly on Ebay. 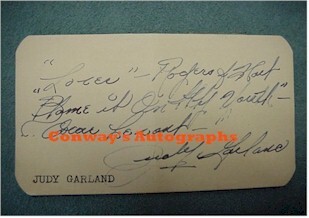 We back up our autographs with 20+ years expertise and Guarantee AUTHENTICITY For Life. 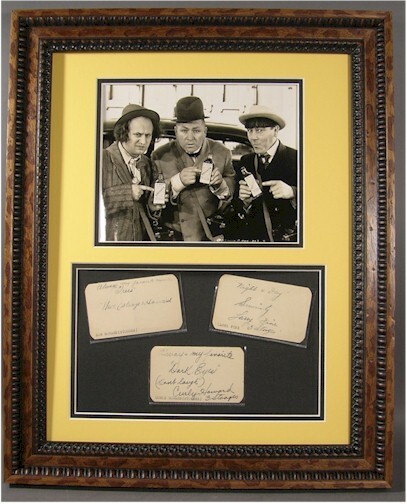 In 25 years of collecting autographs I have never seen a more incredible set of Three Stooges AUTHENTIC signatures then this!